I only attempted cruising as a vacation option later in life. I had been fearful for so long that I would not be able to partake of most of the “cruising life”, including eating, shore excursions, and socializing. Compound those fears with the fear of becoming seasick, and it was not an option for me for a long time. It turns out that I was partially correct with my fears. In my previous cartoon about cruising with IBS, I tried to explore some of the difficulties I experienced, mostly about eating meals. That led me to thinking about what would have made it an optimal experience for me. Of course, that goes under the heading, “fantasy cruising”, and has no basis in reality. But part of me wonders if there might not be a market for a vacation/cruise that caters to people with intestinal issues? We cannot conform to the rigorous routines that “normal” people have. And yet, why not a vacation geared towards us? There are many themed cruises out there which started me thinking, and that led to this latest cartoon. 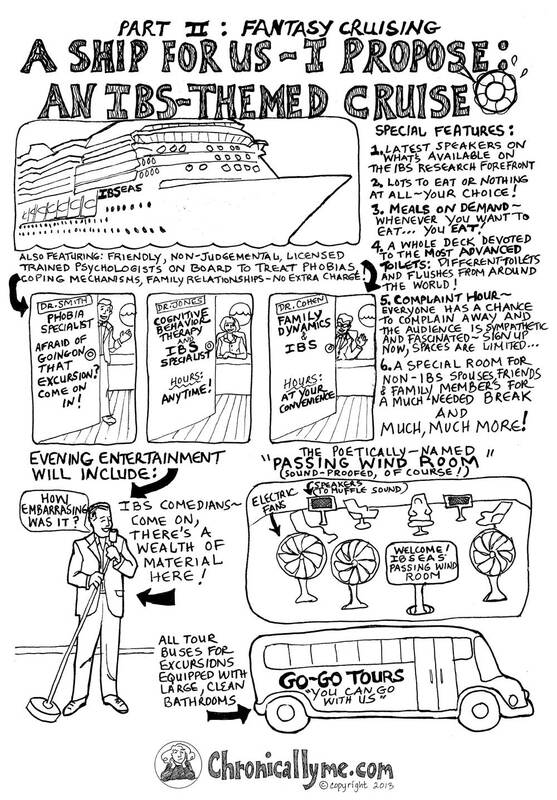 A vacation like this is not limited to a cruise…it could be on land also! This entry was posted in IBS and tagged bathrooms, buses, Cognitive Behavior Therapy, comedians, complaint, cruise, cruise ship, eating, embarrassing, excursions, family dynamics, family relationships, fascinated, flushes, IBS, IBS comedians, IBS-themed, intestinal issues, intestine, meals, non-judgemental, passing wind, phobia, psychologist, research, routines, ship, speakers, specialist, sympathetic, theme, themed cruises, toilets, tour bus, wind by Administrator. Bookmark the permalink. Hello it’s me, I am also visiting this web site daily, this web page is actually fastidious and the visitors are really sharing good thoughts. Thank you for visitng my blog. I agree that there are some great thoughts and responses here. I also get some wonderfull emails. I have someone who designed my site and also altered it for mobile use. I am sorry to say that I personally do not have the answer for you as I am not that tech-savvy.